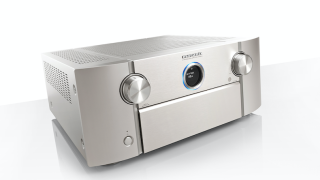 Marantz reveals feature-packed SR8012 flagship AV receiver | What Hi-Fi? The SR8012 is a well-featured 11.2-channel AV amp with eight HDMI inputs, HEOS wireless multiroom support, and network streaming. Expanding the Marantz 2017 AV receiver line-up unveiled earlier this year, the SR8012 (like the SR6012 and SR7012 models it sits above) supports Dolby Atmos in up to a 7.1.4 configuration, as well as the DTS:X and Auro 3D surround sound formats. The 11-channel amp claims a power output of 205 watts per channel, offering not only more channels than its nine-channel siblings but also more horsepower. The SR8012's eight HDMI inputs and three outputs have 4K and HDR (including Hybrid Log Gamma and Dolby Vision) passthrough, and eARC (Enhanced Audio Return Channel) will be supported via a future firmware update. The amp's versatility expands to music playback, too. FLAC, WAV and ALAC files up to 24bit/192kHz and DSD5.6MHz can be streamed from your network or played via the USB port on the SR8012’s front panel. There’s also AirPlay and Bluetooth onboard, as well as HEOS wireless multiroom integration. All this is wrapped in the copper chassis design that's also found in the company’s Reference Series hi-fi range. Marantz says it has been made extra rigid for reducing vibrations in this AV amp. Available in black and silver finishes, the Marantz SR8012 will be available in December for £2699.